Remember when sitting cross-legged on the floor with a coloring book kept you happy and occupied for hours on end? There’s no need to stop just because you’re older. Adult coloring books have caught on like wildfire, trading in the rudimentary outlines of cuddly kittens and cartoon characters for intricate patterns ranging from Tibetan mandalas and Japanese kimonos to American art deco and English gardens. In January 2016, Amazon’s top 10 best seller list included four adult coloring books — two by Scottish artist Johanna Basford, who many credit with starting the craze when her Secret Garden: An Inky Treasure Hunt and Colouring Book was released in 2013. The compilation of hand-drawn illustrations has gone on to sell more than 8 million copies worldwide, according to BBC News. Pitched solely to grownups, Welch admitted that the books are more sophisticated and more “serious art”-oriented. Color Your Own Van Gogh and Color Me Crazy: Insanely Detailed Creations to Challenge Your Skills and Blow Your Mind are just a couple of the books that can be found at Talking Leaves’ Elmwood Avenue location. With literally thousands of selections out there, “color-inners” can choose from lighthearted titles like Martini Madness and Hipster to TV series and movies that have made the jump from screen to coloring page, including Game of Thrones, Outlander, Hunger Games and Harry Potter. Even the Queen City gets its props with local artist and historian Dana Saylor’s architectural coloring book of Allentown (available at the Museum Shop in The Buffalo History Museum). 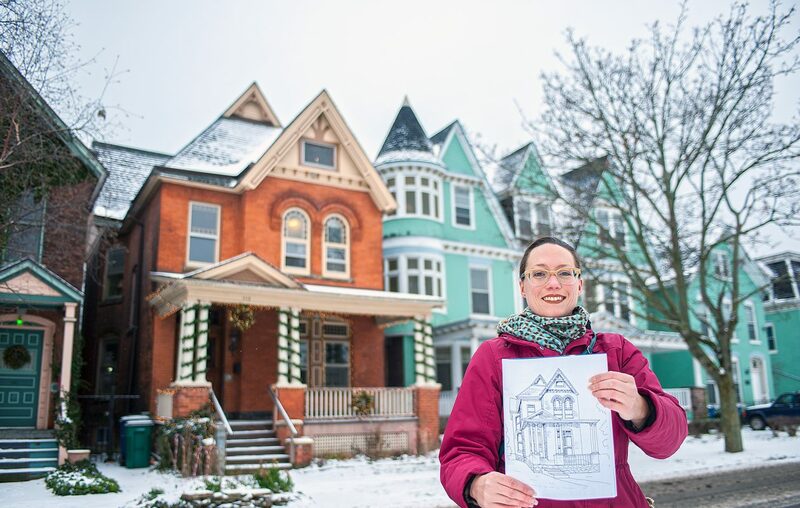 Local historian and artist Dana Saylor created a coloring book featuring the architecture of Allentown, tapping into the demand for interesting, challenging art to color. At MUSEjar in East Aurora, adult fashion and Turkish design are among the best sellers, said owner Vanessa Frost, who added that she is constantly restocking her most popular titles. Foregoing the usual inventory of big box stores like Barnes & Noble, Frost focuses on higher-end coloring pads with heavier paper that can hold up to markers, watercolors and inks. The Bookworm, also in East Aurora, didn’t stock any adult coloring books until they started getting requests for them around nine months ago. Now they carry over 75 titles. “We sell some every day,” said manager Jen Reisdorf, who added that the small shop has sold close to 50 some weeks. The call for adult coloring is so big that Bookworm held a book signing in October with Cosmic Doodles coloring book artist Tina T. Ames of Clarence. Classically trained, Ames said she has always created art for its healing properties. Eventually landing in the corporate world, an illness forced her to stay in bed for several months, where she passed the time “doodling.” And her rediscovered passion panned out. Almost 1,000 copies of Cosmic Doodles sold between June and November of 2015 alone. Niagara Falls native Jennifer E. Drake, assistant professor of psychology at Brooklyn College, CUNY has conducted extensive research on the psychology of the arts. Jill Gillan-Vavreck, owner of New World Gifts & Spa in Williamsville, said her daughter’s college friends stop in and buy adult coloring books whenever they’re stressed out. “It really gets their head out of their school work,” said Gillan-Vavreck, whose coloring book selection includes mandalas, angels, mermaids, constellations, dreamcatchers and fairies. “We’re definitely seeing an interest in art therapy in the adult population,” said Kathleen Skoog, co-owner of Monkey See, Monkey Do in Clarence. The bookstore has held adult coloring classes based on the Color Me Stress-Free, Color Me Happy and Color Me Calm series by Lacy Mucklow and Angela Porter. Tina T. Ames, who also offers private parties (visit Tinatames.com), said her adult coloring classes at local venues like the Newstead Library in Akron and Liberty Vineyards & Winery in Sheridan have drawn double the crowds expected. “For many, it’s the opportunity to be creative without fear if they don’t necessarily have any real artistic ability. It’s kind of like the old quilting bees where women would just gather and have fun,” said Ames.